A Blog about software development and hobby electronics. There's a bug in Chrome on Windows 8.1 that I've hit a few times now, so I figured I'd write a cautionary tale. It's a minor bug, but highly irritating. Whenever you start Chrome, it opens the last set of tabs and URLs you had open, even if your settings are to open a specific set of pages. Nothing you do in Chrome can get it to come back. Note that I call it "trigger" and not "cause" because I don't know what the actual cause of the problem is. I have reported this issue to the Chrome team (at least I think I did). I noticed the issue after Chrome updated, triggered by viewing the "About Page" in Chrome. I thought the update itself introduced a bug, but I have had updates that didn't have an issue. But, it's somewhat inconspicuous, and who checks the help for the about page? 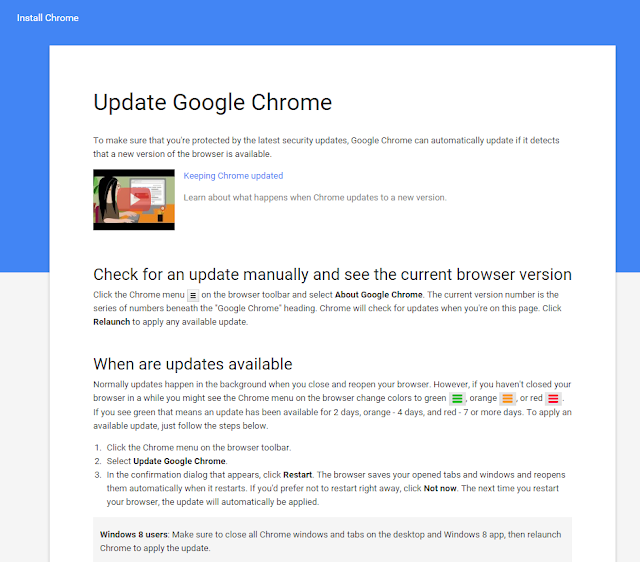 It is best to either reboot after updating Chrome, or make sure that Chrome has fully exited, and restart it. Chrome likes to sit in the background even if no browser windows are obviously open. 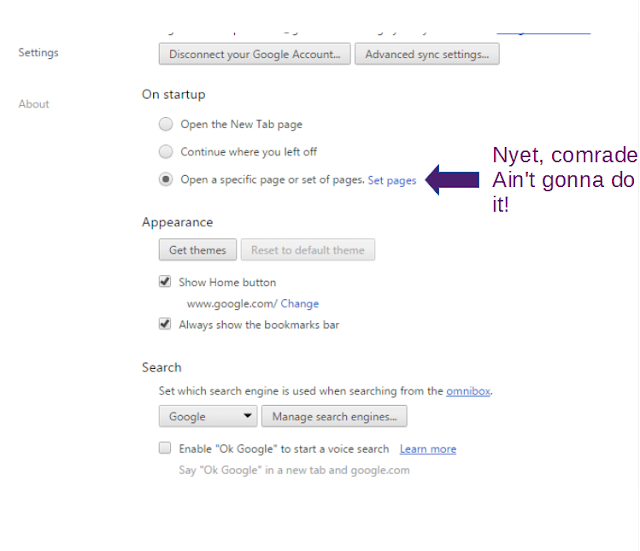 Some applications that rely on Chrome can keep the Chrome process running, even if you use the "Exit" menu on the Chrome menu. Chrome Remote Desktop is one of those applications. Use task manager or Process Explorer to make sure Chrome has exited. If you've already clicked the evil restart button and Chrome's giving you lip, to get Chrome honoring your wishes again, I have found the following workaround. There may be a better way to fix it, but this has worked for me. (Some have reported that removing and re-adding your Chrome Profile works, but my method seems slightly less heavy handed). Make sure Chome isn't running. Delete everything, including subfolders, in that folder. Start Chrome, it will re-create the folders. Some plugins may act like they were just installed, but after a while everything should settle down, and Chrome will be friends with you again. If you know of a more clever, light-handed way to get Chrome back to Earth, please, leave a comment! I welcome you're thoughts. Keep it classy, think of the children. Followup to my "Automated CAD Design" post. A blog post about a video about a blog post. A ramble on web development from a non-millennial developer's perspective. Prototyping with EMW3162 "IoT" devices. What's up with me these days.